eBay's used Korg synth listings. Using the sound engine from the acclaimed Korg Triton heavyweight series of synthesizers, the Korg X50 is a lighter version and still packs a punch in it's more affordable price range. The Korg X50 music synthesizer used the HI (Hyper Integrated) sound engine used on the TRITON series. It gives you pro sounds in an ultra-compact body and is a great affordable choice for live performance and song production. The 64 MB PCM memory contains a wide range of sounds, including piano, strings, guitar, and synth sounds. With 512 sound Programs, as well as 384 "Combinations" that let you use up to eight Programs together, you can start using a diverse selection of great sounds right away. The effect section lets you simultaneously use four effects (one insert effect, two master effects, and one EQ), and provides a full selection of effect types such as reverb, chorus, and delay. The X50 is compatible with Korg's TR line of music workstations so you can share sounds and songs with Korg users around the world. Simply clever fun. An arpeggiator lets you play a variety of phrases using just one finger, and the X50 provides two polyphonic arpeggiators. For example, in Combination mode you can use the two arpeggiators to play drums and bass while you play chords and melody, giving you good control for live performances. In addition to five basic preset arpeggio patterns, the X50 also provides an additional 251 patterns containing various phrases. You can also create your own original patterns and store them in internal memory. Finding the right sound quickly when you have so many to choose from can be a problem on some systems. The X50 organizes its sounds into sixteen categories, and provides a Category Select function that makes it quick and easy to choose the sound you need from the category you specify. There's also an Audition Riff function that provides one-touch audition of each sound. Four knobs can be used to quickly adjust sounds, effects and arp settings, and the ClickPoint cursor makes the X50 simple to use and play. The X50 mobile synthesizer packs professional-quality sounds and a wide range of functions into a light and compact body. 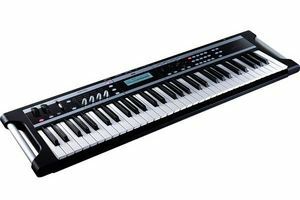 A 61-note keyboard that gives you room to perform, the X50 has a weight of only 4.5 kg --- about the same as an electric guitar. The compact design ensures that it can fit into the smallest home studio workspace, and thanks to its cool side handles the X50 is easy to take along wherever you go. The X50 music synthesizer uses individual outputs, allowing professional setups in which the sounds of specific parts are sent to their own outputs. This can be useful in situations when you may want to EQ and process each sound separately, and for surround-sound applications. 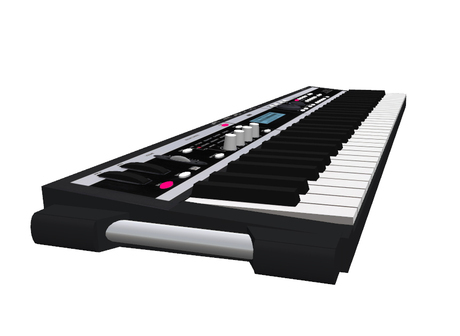 The X50 music synthesizer also provides a USB connector that lets you establish MIDI connections with your computer using a single cable - no interface needed. Multi mode give you 16 parts to create music with, with full effects and other settings to make complete songs using only the X50 and your computer. 128 Multis can be saved and recalled, with 16 preloaded covering many common music styles and genres. It also comes with an editor/librarian software that makes it easy to create and organize sounds using your computer. Two versions are provided: a traditional stand-alone application and an innovative plug-in version (VST, AU, and RTAS formats supported) that can run within your DAW and MIDI sequencing software. Both versions are colorful, graphic-rich, and provide an interface for working with the X50 music synthesizer in all its modes.